"On the Edge of Your Seat: Chairs for the 21st Century," an exhibition at the Center for Art in Wood from May 6 to July 23, 2016. 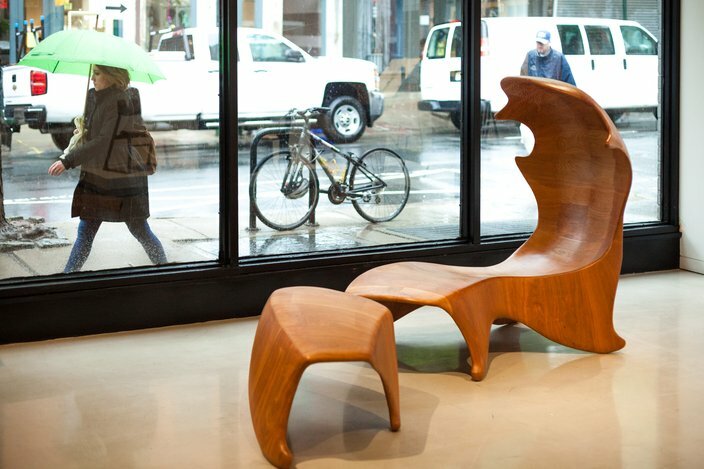 With its display of 45 chairs created amongst 39 international artists (some local), the Center for Art in Wood is challenging Philadelphians to see their seats for what they really are: art. “Chairs are one of the most vibrant, feel-good productions. Every architect makes a chair; every designer has a showcase chair. And for furniture-makers, the chair is a kind of smaller piece that really encapsulates ideas," Susie Silbert, one of four jurors who curated the Old City-based center's new 21st-century chairs exhibit, told PhillyVoice. "Whether design or high-concept pieces, they show ideas in a way that’s ultimately relatable to us." The Center for Art in Wood issued a call to artists last spring and selected 45 chairs from 251 entries. The exhibit is in tandem with the Furniture Society's annual conference, to be held at University of the Arts from June 23-25. Chairs were chosen as the focus of the exhibit because of their historical significance in Philadelphia, home to artisans and cabinetmakers who once led the way with "Philadelphia style" takes on English chairs, 18th-century twist-turn designs, the 19th-century "Rococo Revival" and investment in 20th-century craftsmen through PAFA, the Drexel Institute of Art, Science and Industry, the Philadelphia School of Design for Women (now Moore College of Art & Design) and many more cultural institutions. The exhibit's artisans were tasked with designing pieces that called into question what it means to be a 21st-century chair. The result is a motley grouping of chairs that borrow from the past, take from the earth and collectively showcase what chair design looks like in the first quarter of the 21st century. “I think the artists were alive to the particular needs of the 21st century for greater mobility, for things that collapse, that stack nicely," Karen Schoenewaldt, registrar at the Center for Art in Wood, told PhillyVoice. "And many of them were playing with the theme of using recycled parts, which is certainly not new in the art world, but interesting when you bring it into the realm of chairmaking. 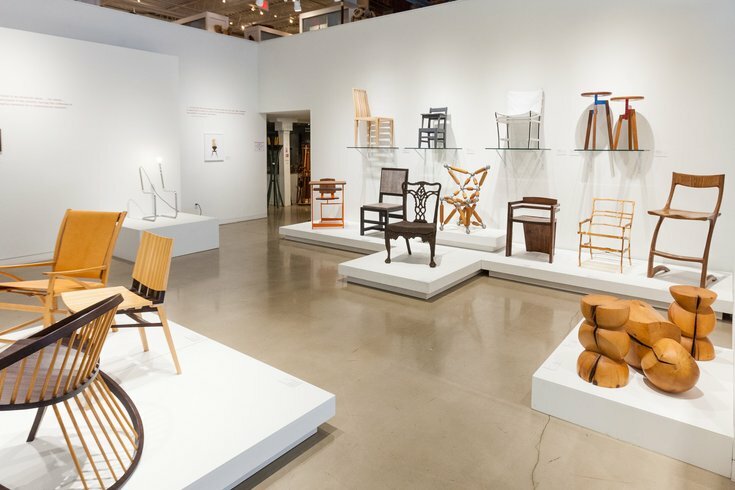 They love the idea of a completely dysfunctional chair, and the center has had a long history of exhibitions that include dysfunctional pieces." 'Cadwalader Chair' by Jennifer Anderson. Prime among them is a Cadwalader chair — its namesake being Pennsylvania General John Cadwalader — by Jennifer Anderson, of San Diego, California. 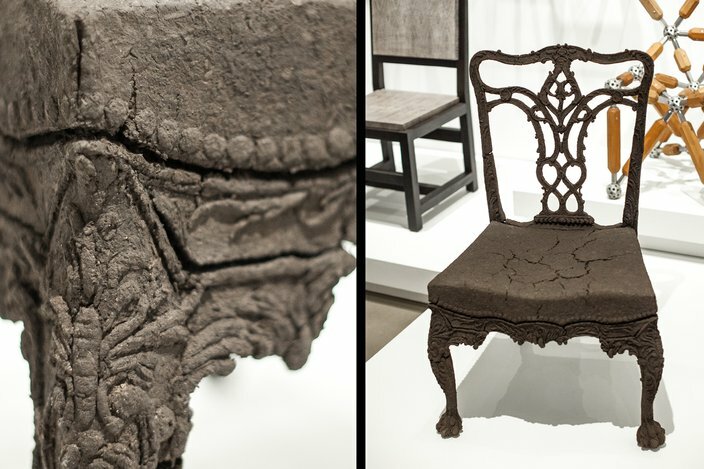 It fuses mud and steel to create a piece that's an earthy take on what's typically perceived as a parlor chair. New Hope's Mark Sfirri, meanwhile, took a 100-year-old pine beam from a barn in Central Pennsylvania to create a series of three white-pine stools. The three pieces (pictured to the far right in the lead image) were carved using only that beam, atypical of the process. 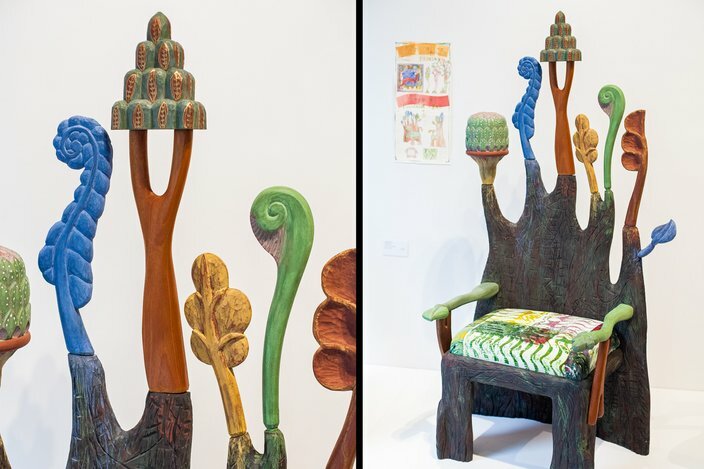 Along these same nature-inspired lines is "Treehouse," a chair created by Bechtelsville, Berks County, native and sculptural furniture designer Amy Forsyth. Made with basswood, milk paint and fabric, it's a playful, throne-like seat that was inspired by an illustration of a manticore Forsyth found in a bestiary of medieval creatures. "It makes all the magic and storytelling of a fairytale come alive," Silbert observed, noting it was a no-brainer among the jurors. "I appreciate that." 'Cocoon Chair' by Keunho Peter Park. Other highlights include a cherry "cocoon chair," by Keunho Peter Park, of State College, Pennsylvania. At 13 feet long, it's one of the biggest pieces in the exhibit — and one of the most interactive. Unlike many of the pieces, you can sit in the chair yourself and experience the echo that emits when you relax into its round high-back. 'Concordia Chair' by Mira Nakashima. 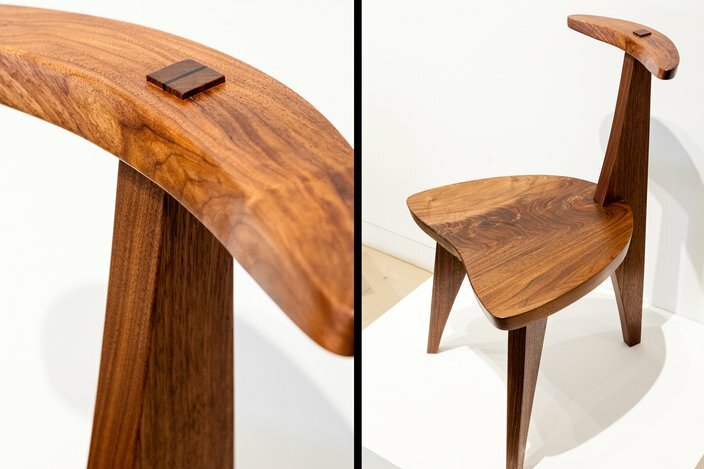 Meant to emphasize the multi-purposes of chairs and how that influences design, New Hope-based artist Mira Nakashima (daughter of famed woodworker George Nakashima) crafted the Concordia, a black-walnut musician's chair first made for New Hope's Concordia Chamber Players. It has no arms and a flat seat, so as to not limit freedom of movement. The back support is intentionally minimal, only there for musicians to lean back on in between performances. Tung oil hand-rubbed on the chair allows its color to deepen with age. 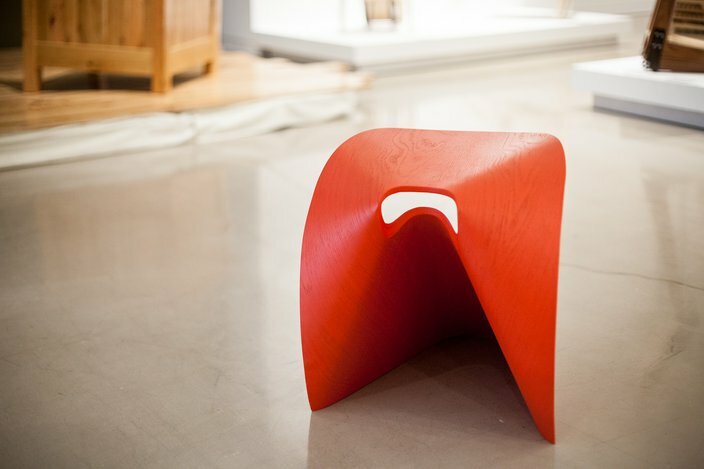 'Fortune Cookie Stool' by California artist Po Shun Leong. You'll also spot a smattering of other eye-catchers in the exhibit, including an interactive chair installation that attempts to reproduce a war veteran's PTSD experience, a rather literal take on an electric chair, a lounge chair made from recycled piano keys and a bent laminated polywood "fortune cookie stool" — the latter with reproductions for sale at the center's store. "I’d like there to be more of as sensibility of furniture as art — looking at things in a different way," Schoenewaldt said. "To see different purposes, different possibilities. You often sit in a chair and you don’t even think about it. The Center for Art in Wood's "On the Edge of Your Seat: Chairs for the 21st Century" exhibit is on display from May 6 to July 23. Admission is free, though donations are suggested.